Over the weekend I visited my favorite antique store. I love strolling around and looking at all the artifacts of the past. I get a thrill when I find a stack of old photos. Looking through them, I always wonder if I will run across a picture of someone I know! But so far, I haven't. Although I must say, the smiles on their faces as they pose by the beach, or on their porch all look so familiar. I wonder why? I love looking for old teacups. When I travel, I like to bring one home with me. Sometimes I will buy china. 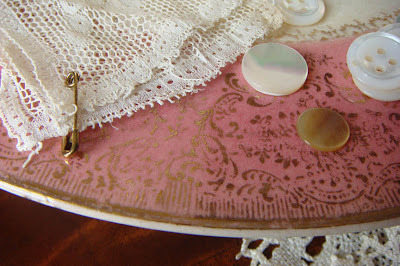 Last week I found 4 old plates that I just loved the color and pattern of. I also keep an eye out for vintage postcards, sheet music, old books and paper oddities. I have seen some really interesting things! But what I look for the most when I am out hunting is antique lace. When I find some, I feel like I have located lost treasure! 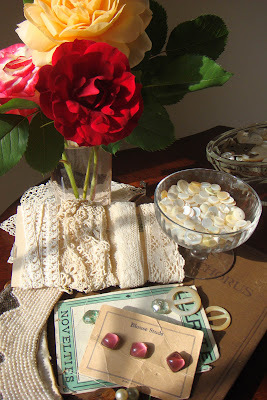 I discovered some lovely pieces this time out as well as some notions. It was a very satisfying hunt! Loved reading this post and looking at your pretty pics. Sounds like you had a wonderful time.